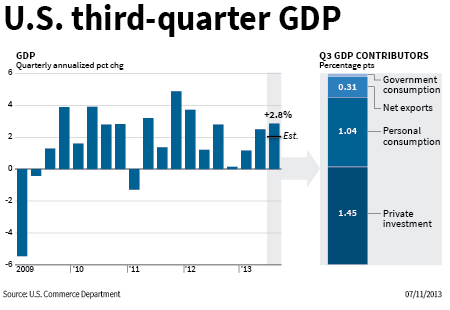 The first estimate of third-quarter GDP showed decent growth of 2.8 pct, with mild inventory buildup and an export boost. Coupled with modest inflation, it couldn’t be healthier – apart from the small matter of a $680 bln budget deficit and $1 trln of annual bond purchases. U.S. GDP rose at a real annualized rate of 2.8 percent in the third quarter, the Bureau of Economic Analysis said on Nov. 7. Economists had expected a growth rate of 2 percent, according to Thomson Reuters. Gross private domestic investment contributed 1.5 percentage points to GDP growth, of which inventory accumulation contributed 0.8 percentage point, and net exports added 0.3 percentage point. Government spending was flat, with federal spending cuts offsetting state spending increases. Real final sales of domestic product increased at 2 percent. The GDP price deflator rose at 1.9 percent during the quarter, as did the personal consumption expenditures deflator. The federal budget deficit in the year to September 2013 was $680.3 billion, while the Fed is purchasing $85 billion of bonds monthly, over $1 trillion per year.